Students are eligible to apply during spring of their 10th grade year. SCA is an intensive, multi-year, pre-college program for high- achieving young women with limited resources who seek to become the first generation in their families to attend college. Through a rigorous summer residential experience followed by monthly programming throughout high school, SCA Scholars develop the confidence and skills to be well-prepared college applicants, successful college students, and professionals who create positive, lasting change. Like all Scripps College Academy programs, the SCA Scholars experience is provided at no cost to the student or her family. SCA Scholars begin by attending the two-week Summer Residential Program which provides the opportunity to experience what it is like to live among their peers and study at a private, liberal arts institution. For many SCA Scholars, this is their first time on a college campus and their first experience living away from home. Students further their academic preparation by exploring issues of race, class, and gender through an interdisciplinary academic curriculum. Participants develop their writing, critical analysis, discussion, and presentation skills under the guidance of Scripps College professors, staff, and undergraduate mentors. In addition to the academic program, scholars attend fun and informative workshops, field trips, and participate in recreational athletic or art activities. Students are required to live on-campus for the full duration of the summer program. There is no cost for participation in the Scripps College Academy; Scripps College and program sponsors cover all expenses. Following the Summer Residential Program, SCA Scholars take part in additional academic and college-preparatory programming throughout high school. These weekend activities include faculty-led book clubs, science research opportunities, SAT/ACT preparation classes, and field trips to museums and other cultural centers. Beginning in their junior year, SCA Scholars and their families receive individualized assistance in the college application and financial aid processes. Through home visits by SCA staff, workshops by admission and financial aid experts, and the mentorship of Scripps College students, Scholars are encouraged and supported in applying to a wide range of college and scholarship opportunities that fit their academic and personal goals. Since the first graduating class in 2005, SCA Scholars have enrolled in more than 75 different colleges and universities across the United States. Consistently, SCA Scholars graduate from high school with top academic honors and pursue higher education. Many earn prestigious national awards following high school, including the Gates Millennium and Posse Foundation Scholarships. One hundred percent of the SCA Scholars high school class of 2016 will enroll in higher education within six months of graduation; 100% will matriculate directly into four-year institutions, with 55.3% attending a “selective” or “most selective” school. Interested in the music industry? Apply to Grammy Camp by March 31st! GRAMMY Camp is a 5-day nonresidential summer music industry program for high school students interested in having a career in music. Hosted on the campus of USC Thornton School of Music in Los Angeles, students from across the country apply for one of the eight offered career tracks. GRAMMY Camp faculty of music professionals as well as guest industry professionals provide valuable insight to give the campers the best chance at achieving success in their chosen career. Financial assistance is available for students. Get Hands on Career Training and Learn from Industry Experts! Summer Pre-College Program at Adelphi University: Apply Today! This summer, students can experience Adelphi University’s personalized approach to education through our Pre-College Program. The program invites rising high school sophomores, juniors, and seniors to spend two weeks living and learning on Adelphi’s beautiful college campus in Garden City, NY. Video Game Programming, and more! Dates: July 22nd-August 2, 2018. Earn 3 transferable college credits! UCLA Summer Sessions offers a limited number of full and partial scholarships to California high school students participating in academic courses or Precollege Summer Institutes. Summer Scholars Support is awarded based on academic ability (and artistic ability, if applicable) and financial need. Priority is given to those without any comparable experience. This year, $100,000 is available to support 40-50 partial or full scholarships. Complete the Summer Scholars Support Online Application by April 1 at 4 p.m.
All supplemental documents are due to the Summer Sessions office by April 2 at 4 p.m.
For more information on the scholarship application, please visit Summer Scholars Support or contact us at info@summer.ucla.edu. The Summer Math and Science Honors Academy (SMASH) is a free of cost, STEM-intensive college preparatory program for underrepresented high school students of color.SMASH boasts a rigorous 5-week, 3-year summer, fully residential STEM enrichment program which provides access to STEM coursework and access to mentors, role models, and support networks of students of color. The Pre-Med Summer Scholar Program is an intense, one-week, primarily educational program incorporating medical guest speakers and hospital-related tours and activities giving the Summer Scholar an involved sense of working within the field of medicine. This is not a “summer camp-like” program and housing accommodations are not included. SCI-Arc’s Design Immersion Days (DID) is an immersive four-week summer program that introduces high school sophomores and juniors of varying backgrounds to the academic and professional world of design and architecture. 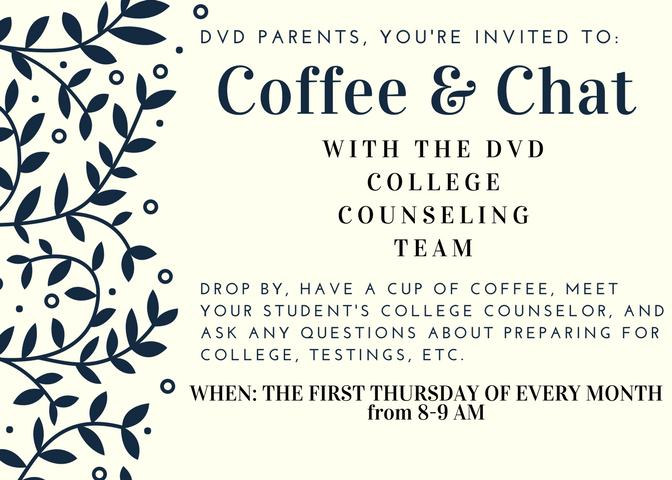 You are invited to the DVD College Counseling Team’s monthly Coffee and Chat! This is a great opportunity to drop by and talk with your student’s college counselor, discuss college preparation, summer opportunities, extra curricular activities, and more! Thank you and congratulations to the DVD Black Student Union for putting on an amazing Black History Month CD this morning alongside our leadership crew. Kudos to all who contributed and performed! What a great end to the week. Good luck to our boys’ basketball team who is participating in the CIF Division 5A Semi-Final Game this evening. Go Wolves! Week 24 updates are below. Reminder that our lockdown drill is next week on Thursday, March 1. You will receive additional information in advisory on Wednesday 2/28. Reminder: Student Led Conferences (SLCs) are the week of March 5 and run Monday-Thursday. Minimum day schedules are in effect those days (can be seen below). 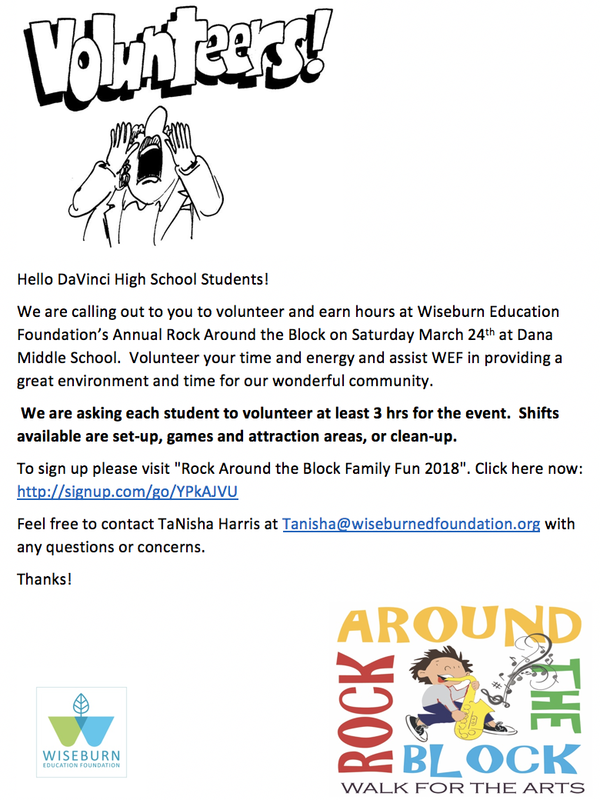 Student Volunteer Opportunity at Rock Around the Block! It’s never too early to plan for college. Start your college search for free at a NACAC National College Fair! Free and open to the public, NACAC fairs connect you to hundred of colleges and universities in one location. Wondering what’s on the minds of teens and how we as parents can help them cope with today’s pressures? 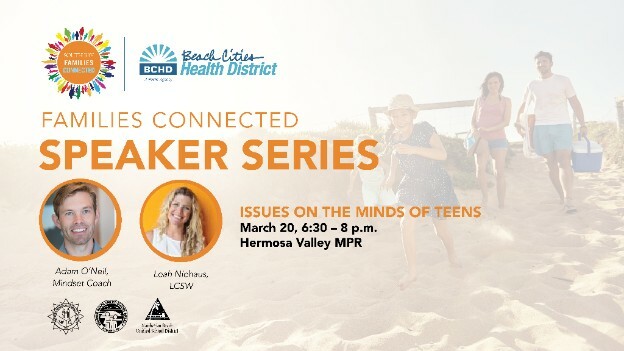 Then please register today for our March 20th Families Connected Speaker Series production, Issues on the Minds of Teens, featuring a teen panel moderated by Leah Niehaus, LCSW, and Adam O’Neil, Mindset Coach. The event is provided in partnership by South Bay Families Connected and Beach Cities Health District, and is co-sponsored by the Manhattan Beach Unified School District, The Redondo Union Unified School District, and the Hermosa Beach City Unified School District. All South Bay parents are invited to this free event. Space is limited, so please register today.